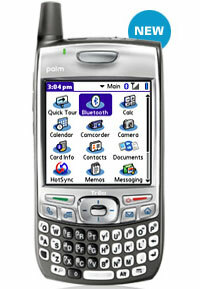 Palm have announced the successor to their hugely successful Palm OS-powered Treo 650 smartphone, the Treo 700p. Although more of a refinement that a full-on product upgrade, the 700p retains the same winning form factor that convinced many people that the Treo 650 was the best smartphone around. 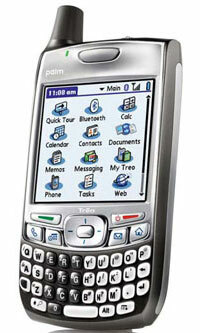 After Palm released its Windows Mobile-powered Treo 700w in January this year, some Palm OS aficionados feared it might mark the end of their favourite operating system, but the 700p sees the company sticking with the highly capable - if rather elderly - Palm OS 5.4.9 OS. With a feature set marrying up with the Windows version, the 700p comes with EV-DO, a 312MHz Xscale CPU processor, beefed-up 128MB flash memory (60MB usable), streaming audio/video, an upgraded 1.3 megapixel camera, Bluetooth and a SDIO slot. Unlike the smaller-screened Windows version, the 700p serves up a bright, crisp 320 x 320 pixel, 65,536-colour display, with the chunky antennae (much loved by Americans, apparently) remaining in situ. Bundled with the phone is DataViz' Documents To Go for reading and editing Microsoft Office files, a PDF viewer and an email client that works with Exchange Server 2003 via ActiveSync, plus POP and IMAP accounts. Yahoo!, AOL and Gmail accounts are also supported. Way back in the midst of time, a Palm executive faithfully promised us that the Treo 650 would support SDIO wi-fi cards, but the long, long wait for the (non-existent) Treo-compatible Wi Fi card to materialise saw us shift over to the Windows mobile platform. Our experience with the i-mate JAM phone wasn't entirely pleasurable, and after getting fed up with its 'undocumented features' we recently took the unheard of step of buying technology over a year old(! ), in the shape of a Treo 650 scooped off eBay for �185. After a year fumbling about with fiddly Windows interface and the stylus-reliant functionality of the JAM, we soon found the ease-of-use, one-handed ergonomics and all-round design features of the Treo to be an absolute revelation. Many will disagree, but since we moved over to T-Mobile's unlimited data usage Web'n'Walk deal, we found the lack of Wi-Fi to be something of a non issue - especially after our miserable time battling with Skype for Pocket PC. With the new Palm 700p offering few real benefits over the 650 - and the very real possibility that the phone may not appear in the UK for some considerable time - we'd still recommend picking up a Treo 650, especially if the prices start to drop. In fact, it's still our number one all-round smartphone choice - an opinion shared by PC World, who recently put the Treo 650 at the top of the pile in a comparison against smartphone big hitters like the T-Mobile MDA, Nokia 9200 and Blackberry 8700c.